Can Wyclef Jean Tap Haiti's Youth Movement? During his 14-year reign as Haiti's "president for life," François "Papa Doc" Duvalier waged a war of attrition against his own people, looted the country's finances and "disappeared" thousands of dissident voices. Duvalier, like capitalism, was no respecter of persons. Knowing this, one would not expect to find an abundance of Papa Doc memorabilia on display in many Haitian homes, but this was exactly what I found during a research trip last winter. In fact, most Haitians I spoke with in Port-au-Prince, from both the Duvalier and Aristide generations, hasten to contrast his benevolent legacy with the chronic turmoil of the Aristide era. There's no doubt that things were better then, one friend told me, when electricity was an everyday affair, when five Haitian gourdes had the purchasing power of one U.S. dollar (vs. 34 gourdes today), when tourism was booming and Haitians had jobs. But what about the impoverished rural areas of Bombardopolis and Jean Rabel, the trigger-happy tonton macoutes and all-around state-sponsored terrorism? Now that every corner in the working-class Delmas neighborhood has either aba (down with) Préval or aba Titid (Aristide) sprayed defiantly on its walls, Papa Doc has become the subject of a systematic forgetting (and forgiving), much the same way that Joseph Stalin has in contemporary Russia. Students of Haitian history know that the lionization of its leaders is nothing new — nearly all of Haiti's 45 heads of state have relied on their ability to appear larger than life to gain, and keep, office. The increasing likelihood that Wyclef Jean could join this illustrious genealogy prompts us to reflect on both the historic role of the presidency as well as what it would actually mean if someone like Wyclef were to win. Strong national consensus has meant life or death for Haiti's presidents. Most presidents, however, manufacture that consensus. During the course of what anthropologist Drexel Woodson calls "the long Haitian nineteenth century" (1804-1915), presidents often employed rural armed militias known as piquets or cacos to solidify power under the guise of genuine civil support. In the 20th century, Duvalier had his tonton macoutes; before him, presidential hopeful Daniel Fignolé had his "steamroller" protest marches. *Dear Wyclef: Please Don't Run! But things fell apart once Aristide left. The ti legliz model spawned an ever-increasing number of localized peasant organizations for support that the fragile state either cannot or will not provide. Haiti's labyrinthine political culture, which saw 34 presidential candidates and 36 separate political parties on the ballot in 2006, is partly due to this explosion of civil society organizations. My research with baz (grass-roots) youth groups suggests a new trend in the way citizenship is exercised in Haiti. Baz modified the peasant organizations of the Aristide era into a model of citizenship defined by their mobility and relationship with other baz. These groups travel long distances to chita palé (literally "sit and talk") with others, resulting in a national network of civic-minded youth. When asked how baz differ from other civil-society groups, one member said that they represent a true movement; they insist that a decentralized dialogue replaced the centralizing force that Lavalas exerted over the past generation. Baz members believe this movement is the key to dismantling the hegemony of the "Republic of Port-au-Prince," but it may also have an important impact on the coming elections, especially for Wyclef Jean, who has made his appeal to the youth base clear. Wyclef is a djaspora, a sometimes pejorative term for expatriates who straddle the line between what is Haitian and what is American. Although Haitians have been leaving Haiti for generations, the title djaspora is a relatively new phenomenon that began with the mass exodus under the first Duvalier regime in the 1960s. Today more than 2 million members of Haiti's "Tenth Department" participate in this complex transnational identity. Wyclef epitomizes the pinnacle achievement of this djaspora identity, which had captured the dreams of Haiti's youth long before his rise to fame. While Haitian youths are struggling to chèché lavi (seek a life), as the saying goes, Wyclef has jwenn lavi (found a life). And why not, when these same youth have been raised by the estimated $1.65 billion in remittances that djaspora members abroad send back each year? Simply put, it's not Wyclef; it's what he symbolizes. Should Wyclef win the November elections, assuming he's even eligible to run, a new chapter will begin for Haiti and its diaspora. Electing a djaspora president could signal to the thousands of Haitians who have made it overseas that it's time to come home and reverse the country's so-called brain drain. 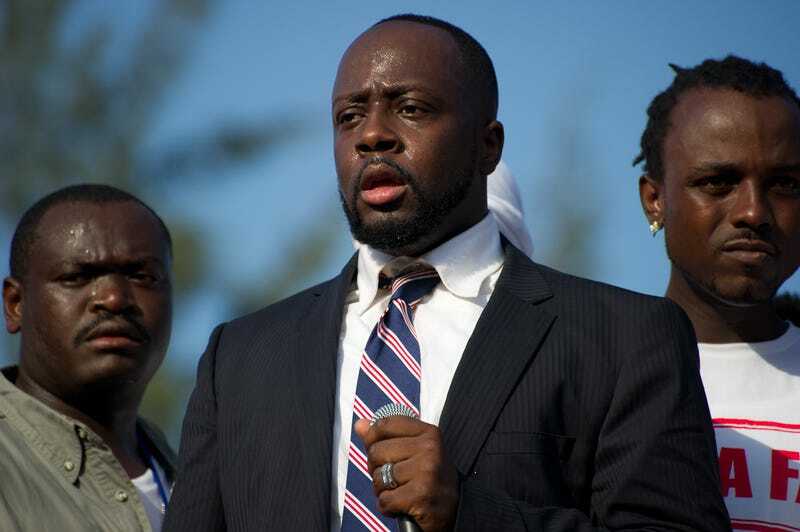 Most reports show that the hype behind Wyclef's candidacy is just that — hype. Wyclef, whose portrait already graces murals and the colorful public buses throughout the country, celebrated his candidacy last Thursday with a pageant of street bands before leaving for his other "home" shortly after. His pseudo-activist music and less-than-reputable charity (Yéle Haiti) make him an ambitious visionary, not necessarily a grass-roots populist. Knowing the decisive role that personality cults play in Haitian politics, we must question how much of this is genuine consensus building among the youth, and how much is shameless self-promotion. So while Wyclef's international visibility might offer Haiti something it's never before experienced in a chef d'état — after all, it's difficult to imagine a foreign coup ousting one of the world's biggest hip-hop stars — the question is whether the youth groups can determine if he will be president of Haiti. Landon Yarrington is a Ph.D. candidate in anthropology at the College of William & Mary.